Bow down the queen! In her first red carpet appearance in over a year, Sandy was looking amazing yesterday at the London premiere of Minions, in a black and paisley print dress by Stella McCartney paired with skinny, strappy sandals. Check in our gallery over 300 HQ pictures from the premiere. 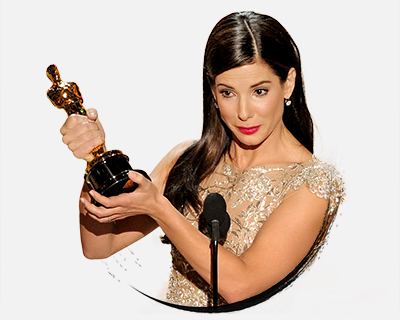 Online since 2002, Adoring Sandra is dedicated to the Oscar and Golden Globe award winning actress Sandra Bullock, celebrated for her performances on the big screen. We're the largest (and oldest) fan site dedicated to Sandra and her career and our goal is bring you with latest up-to-date info, photos and media on her. Please bookmark us and return for your daily Sandy fix. All graphics and original content belong to Sandra-Bullock.net. All images are copyright to the their respective owners, the webmasters claim no ownership and receive no financial gain for this site. We do not support stalkerazzi of any matter. For more information, please check our disclaimer. This is an unofficial website! We have no official affiliation with Mrs Bullock or her management.